Influenster sent me a Voxbox of products to try out. Included in this box was Luster Now Instant Whitening Toothpaste. The product claims to instantly whiten your teeth with one use. I am always skeptical of claims like this. Well I must say this particular claim is true. After one use I noticed an immediate difference in the color of my teeth. They looked whiter. After several uses, the whiteness was amazing. 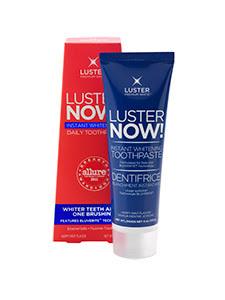 The toothpaste contains Bluverite, a formula that creates an optical effect of whiter teeth. Whitening toothpastes tend to be harsh but not this one. I found it to be extremely gentle on my teeth. I highly recommend that anyone who wants instant whitening to get this toothpaste. Random thoughts: I bought this at Walgreens last week. Impulse buy was $2 off. It was thick & really, really blue while brushing. The pack I purchased had 3 'travel' type tubes. I'm curious about the Luster Now Light System! Ty for this I have tried a few that didn't work!